2019 is going to be all about customer experience over anything else. At present, high-quality software has become a table stake for organizations aiming to achieve bigger milestones. Customer expectations have matured and businesses must evolve to deal with it, as well as confront the challenges of the market. In 2018, we saw an array of new technology solutions surfacing and the empowerment of Software Testing and Quality Assurance. We also saw that Agile, DevOps, DevSecOps, and Test Automation practices soared and sustained in software testing cycle in 2018. The continuous technology advancements keep software testers on their toes to attain precision and accuracy in process and practice. 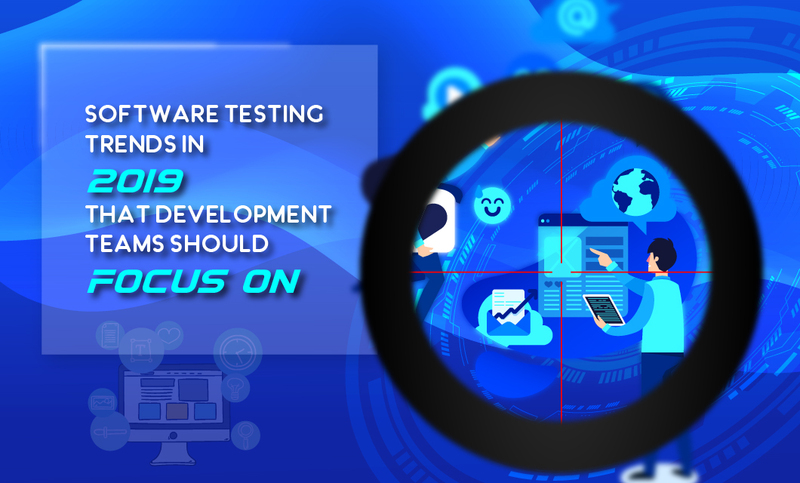 This is going to continue in 2019, and therefore, we have tried and gauged some key trends in software testing that developers should anticipate this year. Needless to say, data will indefinitely influence business decisions and improve decision-making capabilities of management and development team. Therefore, it is imperative to test data and make sure the results derived from it are perfect and delivered in a format that is easily understood. Therefore, testers must test each data terabyte, verify its effectiveness, and break them down into clusters to bring out much-needed outcomes. Quality of data is the primary concern, especially in big data testing. Quality can be attained by taking into account the characteristics, such as data accuracy, precision, duplicity, and data consistency. Testers can perform several testing, including security testing, performance testing, and functional testing. This paraphrase concludes AI in Software Testing is extremely significant. AI should be applied in Software Testing for swiftness and accuracy. And, the application will increase with the digital transformation of businesses. Not only Artificial Intelligence will play an important role in software development and testing processes, but Machine Learning will also secure a critical role. Predictive Analytics, Defect Analytics, and Log Analytics will be positively influenced by machine learning. Intelligent/instant apps today take a center stage. They include native mobile apps that are smaller in size but convenient for users. They eliminate the need to download standalone apps. Mobile apps having faster load time and state-of-the-art user experience is something that we will see high in demand in 2019. ResearchAndMarkets predicts that the global instant app market will reach $93.4 billion by 2026 if the CAGR growth rate is estimated at 30.7% during the forecast period. The fuel for these apps is many, including the deployment of new products using the latest technology paradigms, flourishing big data & analytics market, and a persistent and soaring need for improved analytical tools. Therefore, the requirement for instant apps is going to grow by numbers, and we cannot stop it. What we can do is boost the efficacy and astuteness of the apps furthermore by testing the apps by considering the following factors: security, performance, functionality, accuracy, and any other element specified by the client. Digital transformation is a subject that was discussed and written about broadly in 2018. And, why not? Today businesses are uninterruptedly run and powered by digital innovation. Companies are going through unfathomable digital change. That being said, the evolution has also brought forth several challenges and insecurities that businesses are finding hard to overcome. In the developers’ part, we have used methodologies, such as Agile and DevOps to make the testing processes responsive and streamlined to suit various business needs. However, in 2019, we will experience a tremendous need (more than demand) for continuous Software Testing, Deployment, and Integration. And, the need will only double or triple as and when the business grows. Business digital transformation will only throw more and more challenges towards us in all segments of software development. We have to be prepared to combat these challenges in Security, Performance, and Functionality. We can easily do this by delivering new features in the measured pattern. However, the up and running apps have to continuously integrate and tested to exceed customer experience with performance engineering. Performance engineering, and not just performance testing, will be a major criterion when providing supreme customer experience in 2019. Performance Testing has always been a top factor to consider when determining software testing strategies. In order to be on the top and offer uninterrupted services, developing companies make continuous efforts to ensure that client software applications work perfectly under changing and complex scenarios. However, in 2019, performance engineering will take control over the engine. Factors that influence Performance, Security, Usability, Scalability, Network Compatibility, Cost-effectiveness, and Speed will be given primary focus. Testing is shifting its gear from mere bug removal to giving customer satisfaction while achieving business goals. Performance engineering will ensure the development of high-quality web and mobile applications, which will invariably increase customer experience and satisfaction. The entire system, right from hardware and software to configuration and evaluation will be observed to generate maximum revenue. Testing will be hereby included earlier and earlier in process development. And more companies will promptly adopt DevOps and Agile models. Not just the methods, but also continuous testing and monitoring approaches. We have to improve the culture of ‘Continuous Software Testing and Improvement’ to enhance the quality and functionality of client products. A lot more trends will be added this year, which is an indication of the critical change companies and Software Testing and QA team will go through to stay relevant and grow in 2019 and further.